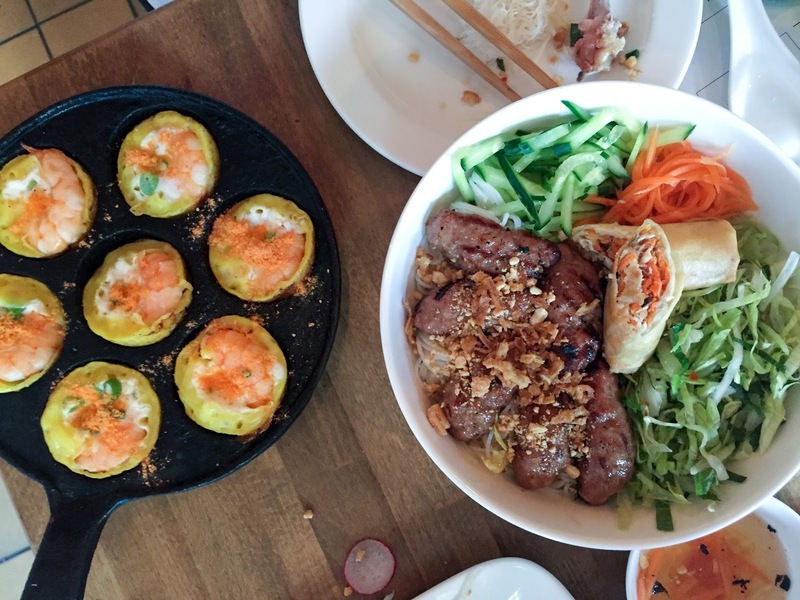 When I was travelling around the South of Vietnam, I was besotted by the food there. Giant bowls of steaming hot broth came with tangles of noodles, and baskets of fresh glistening herbs to tear into, to season each mouthful. Each street corner was cluttered with ladies hunched over charcoal barbecues, wafting smoke lazily as skewers of meat sizzled away. Every scent was mouth-watering, and I found it almost impossible to go by several hours without a snack. 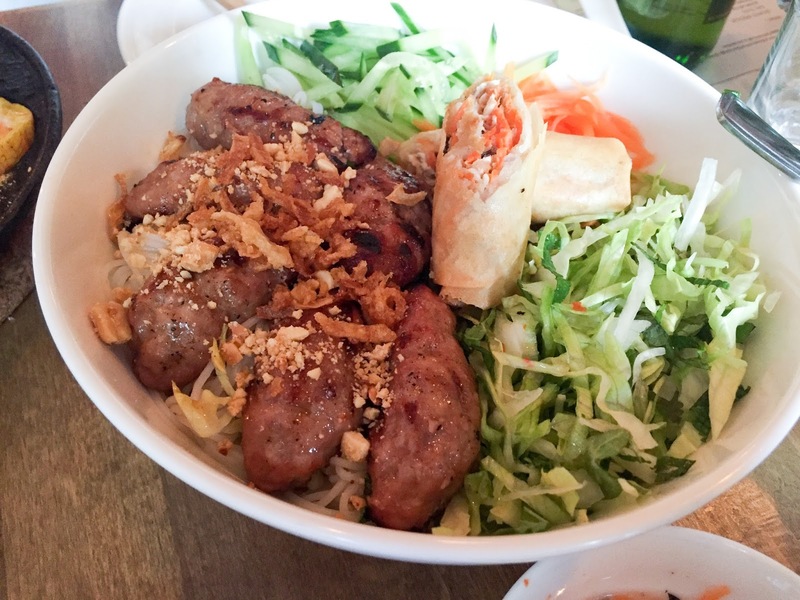 Banh Banh has opened recently in Peckham Rye. Great! Near my house. Owned by Peckham-born Vietnamese siblings, the restaurant inside is light and airy, a small number of wooden tables, nearly all booked. 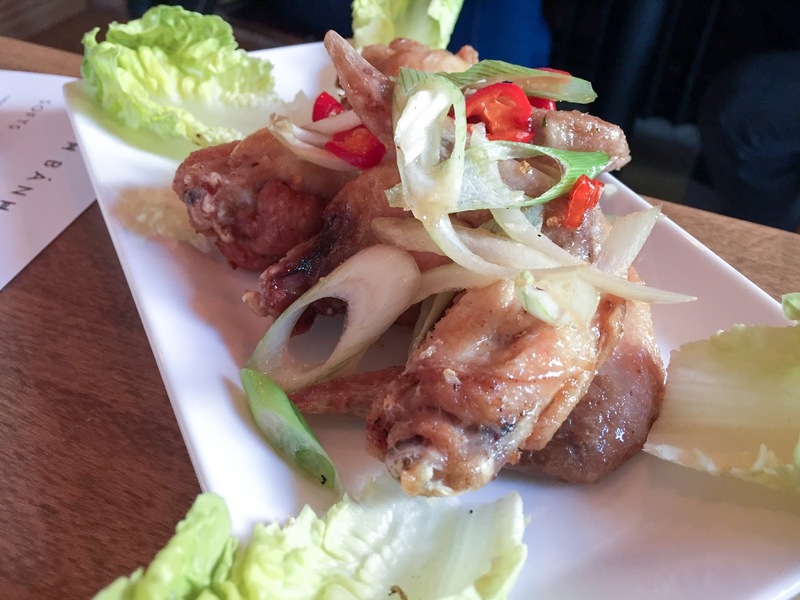 The menu is short, concise and keenly priced, ranging across the ubiquitous summer rolls, through to noodle salads and pho. Banh khot pancakes (£9) pictured above are their speciality; small, crisp savoury pancakes, their predominant flavour is coconut. 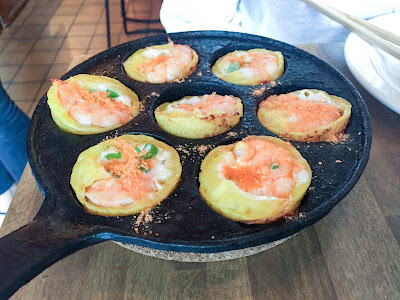 A large prawn nestles in the middle, and the idea is to wrap the pancake in lettuce and herbs, dip in a nuoc cham-based dipping sauce, and eat. It's a messy business, and unfortunately I didn't really get on with them. They were just incredibly bland. Flock and Herd fish sauce wings (£6) were impressive for the meat's good provenance, but were not even comparable to ones better, such as Salvation in Noodles' version, or those of Smoking Goat. They were apologetic in flavour, lacking in a crisp exterior. We lost interest quickly. It was a very warm evening, so instead of the pho, we opted for the cold bun noodle salad (£9). 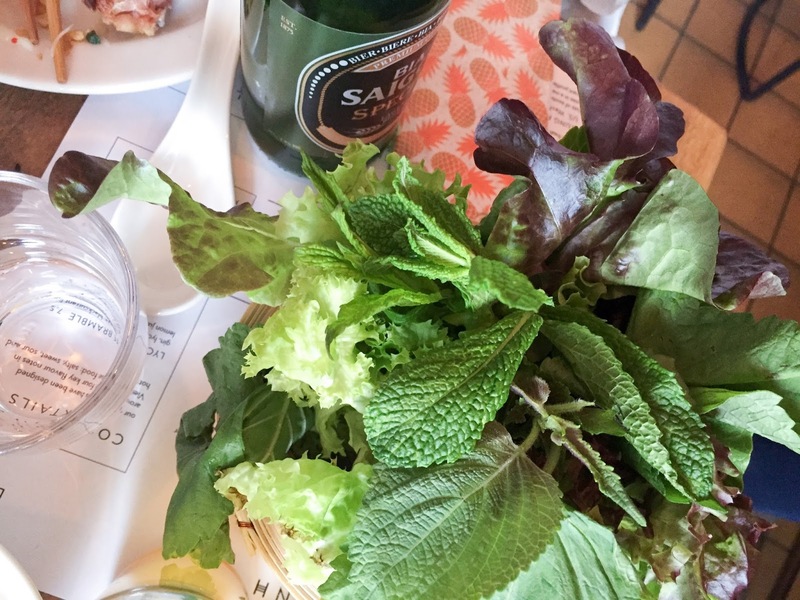 This came with barbecued pork patties, a spring roll, julienned lettuce and cucumber, all to be mixed in with fried shallots, noodles and a fish sauce dressing. Once again, I found the flavours to be muted; it was all very mild and felt a bit generic. Better was the papaya salad, which had proper acidity and zing. The black sesame cracker was a nice touch, to pile the salad on to. Likewise too, the beef in betel leaves drew no complaints with us, and we happily munched away on these, drenching the vermicelli noodles underneath with more nuoc cham sauce. All in all, it was all a bit meh for me. I had expected fun and exciting things from a place that billed itself as 'Vietnamese street food', but actually everything felt a little tame. I really wanted to like Banh Banh, but there was just no magic. Yep, bang on. In Vietnam the food is so vibrant, and everything meal was a joy for me there. Huge, punchy flavours but so well balanced. Banh Banh was sadly just boring. I so wanted to like it too! 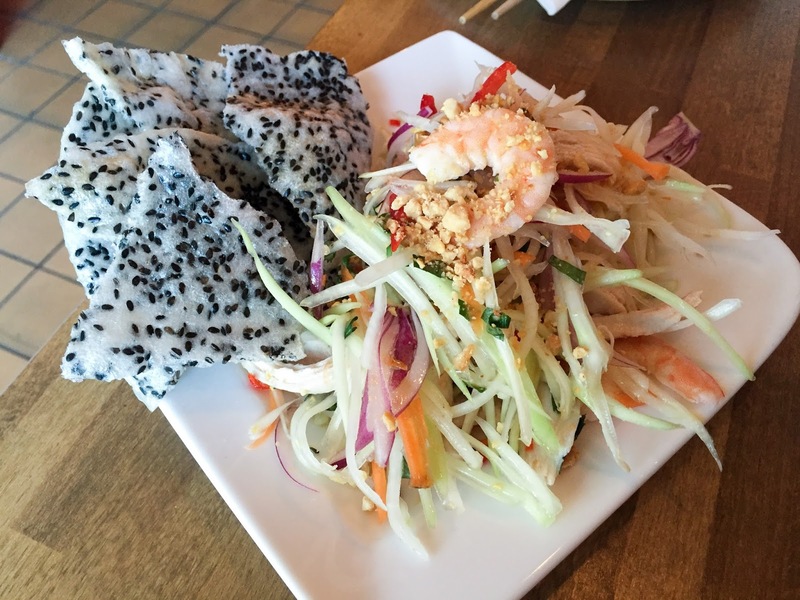 I really wanted to love Banh Banh but have to agree with you. I found the food I tried a bit bland and underwhelming. 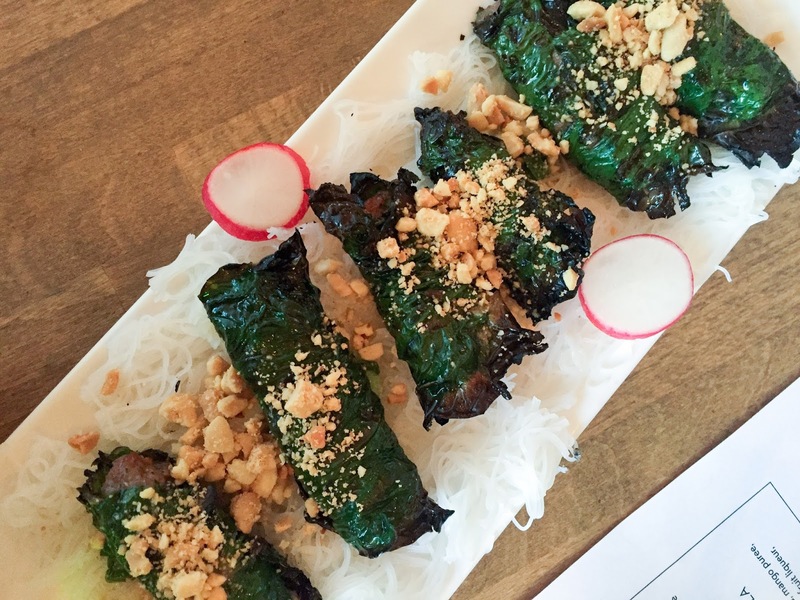 Banh Khot were one of my favourite discoveries in Vietnam earlier this year. Sad to find the ones at Banh Banh weren't all that. Yes, another voice in agreement, unfortunately. Will stick to one of the Deptford spots for something a bit more punchy/authentic. Vietnam has been on my list of places to visit for so long - it looks so lovely there! I'm literally drooling over all this food right now! hels - alas. maybe the pho is good? dunno. TGG - yep, their signature dish was literally not worth eating. sad. nick - which is your fave deptford spot? I went when it was in the record shop in bussey basement and had the pho. It all felt fresh and nicely sourced but it was underwhelming, short on taste, and missing the array of herbs and bits you often get with a good pho. I'd like to try the new spot but it's always jammed. Hype eh. The location helps too as few midrange options there.